Well, it's a terrific Tuesday, and since Winter Storm Janus is heading our way, school is out! I figured since I had some time, I thought I'd tackle technology. 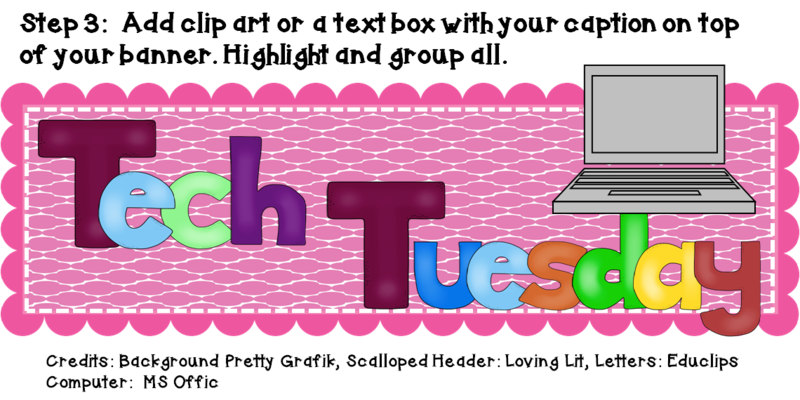 I truly love learning how to make and use different types of technology, and I think that's why I've had so much fun with blogging. I've gotten to learn something totally new. At first, I had no idea how to link files, how to set up a post, how html works, etc., but I am not afraid to mess up. I think that is very important when learning new tech skills. I figure you can always hit undo, right?? I thought for today I'd show how to make the cute banner I did above. I have worked with clip art from several clip artists, and I thank them for doing something I do not know how to do (but I really want to learn!!). So how do you work with clip art pieces to make banners, buttons, etc.? The answer...in layers!! First, you open up Powerpoint and insert a banner like this one from Erin at I'm Lovin Lit. (Huge Seller's Tool Kit for $5.00=Great Buy!) It does not matter what size you make it as once your total graphic is complete, you can resize it in the post or document you are making. Next, if you want to embellish the header with a contrasting or coordinating background to match your blog or something you plan to include in your document, you can do this by inserting a shape from Powerpoint and filling it with a picture (select the background "fabric" you like) and outline with a coordinating line color. I chose white and made it dashes for a sewn look. After you've got the base banner the way you like, then you will add clip art. For this one, I chose bubble letters from Educlips which are inserted one letter at a time. I resized and placed them where I wanted them to go and inserted the computer graphic from Microsoft Word. The last step is the highlight all the individual pieces (by clicking on them) and grouping them. Once in a while, I will miss one. Don't worry. Hit undo and try again. Once your graphic is grouped, then all you do is right click and "save as a picture". That's it...you're done! This is great! I remember the steep learning curve trying to figure out all these little tips & tricks when I first got started. :) One more tip when grouping -- I love using CTRL+A to very quickly select all objects. Makes grouping a cinch!! and Control G for group...thanks for the tip and thanks for dropping by, Amy! 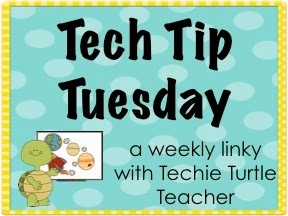 I love your Tech Tip! Very easy directions to follow for creating cute banners and buttons. Thanks for linking up! I have never grouped before .. ya learn something new everyday.. I'm off to try! Thanks!